Has "stop smoking" or "quit biting my nails" appeared on your list of New Year's resolutions as long as you can remember? No matter how much you want to put an end to your addictions, taking the first step is often a little challenging. Luckily, yoga can help you finally kick your bad habits and embrace healthier choices. 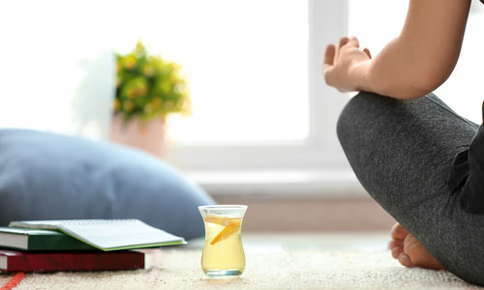 Meditation, an integral aspect of your yoga practice, will help you avoid urges and cravings that may have kept you from reaching your goal in the past. As you meditate, you'll clear your mind of worries, concerns and urges and focus only on your breathing and the way your body feels at that exact moment. At the end of a meditation session, you might just discover that your craving has subsided. Stress is a crucial factor in the development of bad habits or addictions. When you feel anxious or stressed, you're more likely to light up a cigarette or eat an entire pizza yourself. Yoga decreases stress naturally, eliminating your need to seek comfort in smoking, overeating, drinking or other things that aren't good for you. In addition to meditating, you'll also reduce stress by manipulating your body to master complex yoga poses and practicing breath control through deep breathing. As you perform each pose, you'll breathe in deeply, engaging your diaphragm, then slowly release the breath. Deep breathing helps calm your mind, lowers stress and reduces your blood pressure and heart rate. Although yoga is very effective in controlling the impulse to smoke or overeat, it's equally effective in controlling other habits, such as nail-biting. Boredom, frustration, impatience and dissatisfaction are key reasons that people perform body-focused repetitive behaviors like biting their nails or picking at their skin, according to a study published in the Journal of Behavior Therapy and Experimental Psychiatry. Yoga offers a healthier way to cope and may decrease unpleasant or uncomfortable feelings. Meditate. You can probably spare a few minutes to meditate, even if you're facing a looming deadline. After you've cleared your mind, you may just find that you don't even want to make a trip to the vending machine or nibble on your nails. Slow Your Breathing. Rapid breathing can occur when you feel stressed or anxious. Unfortunately, the faster you breathe, the more stressed you may feel. The next time you feel stressed, try a little yogic breathing. Inhale deeply through your nose. Hold the breath for a few seconds, then slowly exhale out your mouth. Repeat as needed throughout the day. Try a Few Poses. You may not be able to break out your yoga mat in the middle of a busy office, but you can still take advantage of the calming effects of yoga. Some poses, like cat-cow, can be easily transformed into chair poses. As you inhale, arch your back, keeping your head erect. Exhale slowly. As you breathe out, roll your upper torso and your head forward, then inhale and return to the starting position. If you happen to have a private office or can find an empty room, try a few calming poses, like the child's, cobra, corpse or bridge poses. Yoga offers the ideal way to overcome your addictions and gain control of your life. Attending class not only helps you ensure that you're performing poses correctly, but also offers a nurturing, supportive environment that can enhance your yoga experience. Not sure which class is right for you? Contact us and we'll suggest a few options.